All transactions are safe and secure with a reliable history in online purchasing behind each of our associates. Buy the Thor Asgard Thunder t-shirt to own Thor clothing and merchandise. 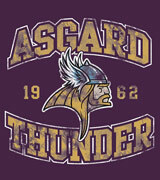 If you are looking to cheer on the main man, then this Asgard Thunder design is the perfect way to do it. Wear it to do battle with Thor's adoptive brother. Pair it with a green Loki shirt costume to help balance your inner mischievousness. Created by writer Stan Lee and drawn by Jack Kirby, Loki first appeared in the comic book Venus #6 in 1949. Check out some of the villain's deviant adventures in the Mighty Thor comics by Marvel. In addition to the Thor Asgard Thunder tee above, browse the Thor Clothing Gallery for more apparel like men's and women's clothes, kids shirts or hoodies.